The mental health benefits of exercise are well documented, known to reduce stress and increase “feel good” hormones like dopamine. But many of us seeking better mind-body heath overlook the benefits found in simply spending time outdoors. It turns out the age-old adage is correct: fresh air is good for you! 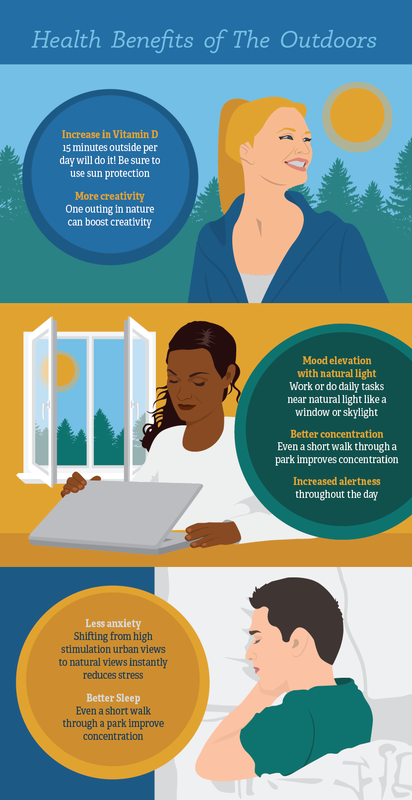 While outdoor physical activities such as jogging, trail running, and hiking combine both physical exercise and the outdoors for a mental health boost jackpot, according to both the National Institutes of Health and Harvard Medical School, simply spending time in nature in any form can improve your mental outlook, in addition to providing physical benefits. How refreshing! Getting outside and taking a stroll truly can clear your head while also boosting your immune system and elevating your sense of well-being. If you can get outdoors regularly, you can trade seasonal light therapy boxes and artificial indoor lighting for natural light, which floods your body with vitamin D and immediately improves your mood. Just 15 minutes of natural sunlight per day is known to reduce depression and anxiety levels. Perhaps even more importantly, vitamin D and all that natural sunlight helps you sleep better at night. A study out of the Saint Louis University School of Medicine noted that natural sunlight helps set our body’s internal clocks. And the better rested we are, the better our mood and mental state. But stepping outside does more than offer sunshine. Studies show that those living in urban environments have to contend with sensory overload on a daily basis, causing what researchers call cognitive fatigue. Finding green space or stepping into a park or garden can give the brain a break from urban stimuli. A recent epidemiological study has shown that people who move to greener urban areas benefit from sustained improvements in their mental health, according to Frontiers in Psychology. In fact, a recent Scandinavian study found that office workers with even views of trees or nature had lower stress levels than those who had city views. Nature improves concentration as well, helping both children with attention deficit disorders as well as elderly citizens combating dementia or Alzheimer’s. Without the rush of man-made stimuli, the human mind is freed up to be more creative, and having lower stress levels allows us to focus on the task at hand better. This is why you might get your best ideas during a day fishing on the lake, or make that breakthrough on a work-related problem while on a walk in the woods. Getting your daily dose of nature doesn’t have to involve traveling long distances or taking up extreme outdoor sports like backpacking or kayaking. While a daily walk or bike ride is ideal, any green space can boost your mood and lower your stress and anxiety levels. Even sitting outside on a patio or balcony can give you access to sunshine and, at the very least, a skylight over your work or living space can provide natural light. Consider walking or biking to work each day, taking a new route through a green space or park instead of along city streets, or opting for the scenic commute instead of the freeway. While outdoor sports such as hiking, fishing, kayaking, and skiing successfully combine exercise with outdoor stimulation, any form of outdoor living will elevate your mental health. Simply walking through a forest has been proven to reduce levels of the stress hormone cortisol and reduce blood pressure and heart rate. So take a daily walk, try your hand at fishing, or simply sit and read in a garden to see benefits. Capitalizing on the restorative properties of peaceful outdoor settings doesn’t mean city life is all bad. Living in an urban environment is a happy reality for many who have chosen to live and work in urban centers, and has many upsides. This is where Attention Restoration Theory (ART) comes in. The thinking behind ART is that urban settings can have an excess of stimuli (car horns, sirens, people) that demand our attention whether we are consciously paying attention to them or not, whereas natural settings require our attention but also reward us with feelings of pleasure and help restore our attention. For urban dwellers, visiting a setting such as a park can feel like an oasis, in that it provides the feeling of “getting away” even though you may only be minutes away from your office. Getting outdoors to feel happier and healthier is both intuitive and backed by medical science! Make yourself a promise to spend just 15 minutes or more in a natural environment per day to reap the rewards.